I just wanted to test my Logitech MK320 Keyboard and Mouse combo will work with my Samsung galaxy S4 or not. The result was positive, the keyboard and mouse worked very well. As the MK320 have an adapter I had to connect the adapter using an OTG cable. That’s all the Keyboard and mouse worked. No settings need to be changed. If your Keyboard or mouse does not have an USB dongle you may try by enabling the Bluetooth and search for keyboard and mouse and pair it. When ever you need to use it you will have to enable the Bluetooth on your phone. 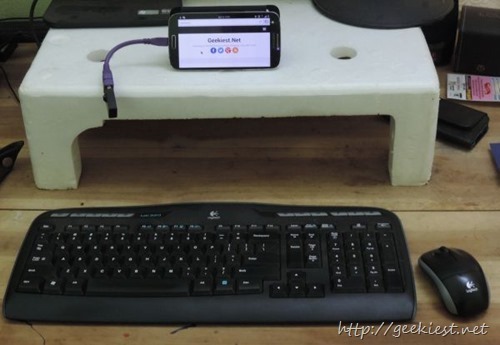 You will need OTG cables for connecting Dongles with your phone. OTG cables are available for just below INR 100 (less than 2 USD). Which will also help you to connect your USB drives to your smart phone too. Here is the link to Amazon.in from where I purchased it. There was an offer of getting 1 Free when you buy two, don’t know that offer is still there or not. make sure before you buy that.